African American Brides Blog: Ka Ching! So, guess which former hip-hopper is now the richest man in Hollywood? 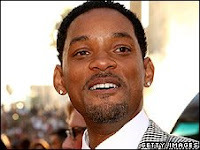 According to Forbes magazine, Will Smith is now the man. He reportedly earned $80,000,000 last year. That's thanks to films like I Am Legend, Hancock and The Pursuit of Happyness (which also starred his son). Eddie Murphy is the third highest paid actor. He made "just" 55 mil. And don't believe the hype that Oprah Winfrey's star is falling. The self-made billionaire rests at the top of Forbes' Celebrity 100 list for the second year in a row. She made $275 million last year. Next year, she will debut the Oprah Winfrey Network in partnership with Discovery Communications.